Admission is $25; $15 for THNOC members; and free for Caillot Circle, Jackson Society, Laussat Society, and Bienville Circle members. Reservations must be paid in advance. 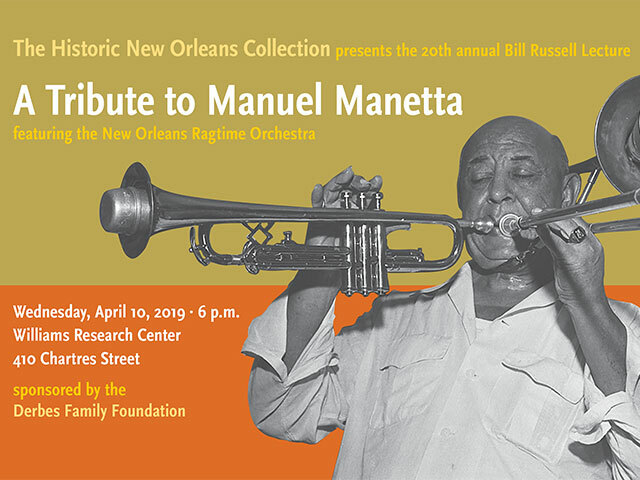 The Historic New Orleans Collection will present the 20th annual Bill Russell Lecture—“A Tribute to Manuel Manetta,” featuring the New Orleans Ragtime Orchestra—on Wednesday, April 10, at the institution’s Williams Research Center, 410 Chartres Street. The event will also be streamed live on THNOC's YouTube channel. The versatile jazz musician Manuel “Fess” Manetta (1889–1969) played piano and violin as well as brass and reed instruments with such musicians as Manuel Perez and Papa Celestin. With a foundation in the European classics, the Algiers native auditioned for a piano gig in Storyville by playing the overture to an opera. After the red-light district closed, Manetta went on the road with Kid Ory in 1919, and during the 1920s he was hired to perform on riverboats operated by Streckfus Steamers, the company that previously gave Louis Armstrong his first opportunity to tour outside of New Orleans. Manetta spent most of his career in New Orleans, however, which might explain why he is not as well known as many of his peers. From the 1930s on, “Fess” Manetta concentrated on teaching more than performing, with students such as Henry “Red” Allen and Buddie Petit carrying his legacy forward. This year’s Russell Lecture highlights Manetta’s contributions over a 60-year span. Each year, THNOC hosts the Bill Russell Lecture to explore new topics on traditional jazz. This year’s lecture is sponsored by the Derbes Family Foundation. Reservations are required and may be made by online at my.hnoc.org or by calling (504) 598-7146. The Historic New Orleans Collection’s annual Bill Russell Lecture honors noted jazz historian Russell William Wagner (1905–1992), whose research focused on traditional New Orleans–style jazz and related musical forms such as brass band, ragtime and gospel music. The William Russell Jazz Collection at THNOC encompasses Russell’s research, audiotapes, programs, posters, correspondence, films, business cards, notes, clippings, and scrapbooks. The Russell Collection is available to researchers at THNOC’s WRC, located at 410 Chartres St. and open Tuesday–Saturday, 9:30 a.m.–4:30 p.m. For more information, call (504) 523-4662 or email wrc@hnoc.org.